It seems obvious that as time passes, things change: as summer turns to autumn, the leaves change from green to brown; as I type, words are added to the page; as an arrow flies through the air, it changes its position; and as the poker that was used to stoke the fire cools, it changes from being hot to being cold. But apparently obvious claims are grist to the philosophical mill, and so, unsurprisingly, philosophers have spent a great deal of time worrying about whether the (apparently) simple idea of change over time in fact makes any sense at all. Eleatic philosopher Parmenides (circa 5thC BCE) argued that although our senses seem to reveal a world of constant change, they deceive us: in reality, nothing changes, and the world is static. Parmenides’ argument against the possibility of change is as follows: take an apparent instance of change, for example, some particular leaf’s changing from green to brown. If the leaf really changed from green to brown, then a green leaf ceased to exist and a brown leaf began to exist. But it makes no sense to say that the green leaf ceased to exist, because if it doesn’t exist, we can’t talk or think about it – for there is nothing for us to talk or think about! So, there is no way to make sense of the apparent change in the colour of the leaf; and because any instance of change would have to involve something’s ceasing to exist, there is no way to make sense of change. Parmenides’ argument might seem silly – leaves do change colour! – but it can be treated as a challenge: try to describe what happens when something changes without talking (or thinking) about things that don’t exist. In the case of the leaf changing colour, the challenge seems easy to meet: there is this thing, a leaf, which was green and is now brown. But it also seems true to say that Parmenides, for example, has changed from existing (in the 5th C BCE) to not existing (in 2017). How can that be true, if there is now nothing to which the name ‘Parmenides’ refers? When we say ‘Parmenides no longer exists’, what exactly are talking about? Some philosophers respond to this puzzle by denying that Parmenides has ceased to exist: they argue that time is a dimension like the three dimensions of space, and therefore that past individuals like Parmenides still exist (albeit located in a past part of the timeline). Other philosophers – ‘Presentists’ – reject the idea that time is a dimension, and really do think that Parmenides has ceased to exist. An important part of the Presentist project is to explain what we are saying when we say that Parmenides no longer exists. Parmenides’ disciple Zeno (5th– 4th C BCE) described a number of famous arguments against the possibility of motion – which is, of course, a kind of change. One of these is the Paradox of the Arrow, which goes like this: consider some period of time during which an arrow is apparently in flight. If we assume that any period of time is made up of moments of time – a bit like the cells that make up a reel of film – then we can ask: for any moment that is part the period, is the arrow moving or at rest at that moment? (In other words, if we froze time during the arrow’s apparent flight, would we see an arrow that is moving or an arrow that is stationary?) According to Zeno, the obvious answer is that at any moment in the period, the arrow is at rest. But then it follows that the arrow never moves: after all, if it as rest at every moment in the period, then it must be at rest throughout the period. And there is nothing special about the arrow: if Zeno is right, nothing ever moves! If we grant Zeno the assumption that any period of time is made up of moments of time, then the correct response to the Paradox of the Arrow seems to be as follows: what it is for an arrow (or anything else) to be in motion during some period is for the arrow to be located at successive places at successive times. So of course we wouldn’t see the arrow moving if we froze time during its apparent flight! But that wouldn’t mean that the arrow was at rest at that moment: it would still be moving, because it would still be true at that moment that it is located at different places at different times. The above response to Zeno’s paradox shows how useful it is to talk about moments of time – in other words, to think of time as a dimension – when we are describing instances of change. Consider the case of the leaf again. I said above that it is easy to describe a change in the colour of the leaf: the leaf was green and it is now brown. That’s fine as far as it goes, but some philosophers argue that it is not the end of the story. 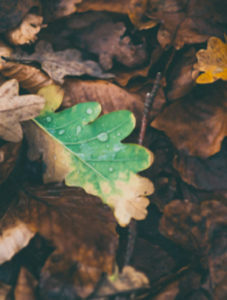 In particular, some philosophers – ‘Eternalists’ – think that a more accurate description of change in colour of the leaf is as follows: the leaf is green at some moment of time in the past and brown at the present moment. Why do they think that this description of the change is more accurate? There are two reasons. First, they believe that time is a dimension just like the three dimensions of space. (They argue that this view of time is supported by modern physics.) And if time really is a dimension, then a description of change in terms of moments of time is more accurate than one in terms of how things were, are now or will be. Second, some Eternalists also think that there is no objective distinction between the past, present and future. That means, for example, that there is no answer to the question of whether the Battle of Hastings is really located in the past or future: it is located in our relative past and in (e.g.) Boudicca’s relative future. And they think that the best way to capture the relativity of the past, present and future is by talking about moments of time, rather than how things were, are now and will be. But it could be that describing change in terms of moments of time brings its own problems. Contemporary philosopher David K. Lewis (1941-2001) was an Eternalist who thought that time is a dimension and that there is no objective distinction between the past, present and future. But he argued against the idea that we should describe change in terms of how things are at different moments of time. His famous ‘Argument from Temporary Intrinsics’ goes like this: suppose I change from sitting to standing. What is the most accurate way to describe this change? One option is to say that am sitting at some (relatively) past moment of time and standing at the (relatively) present moment. But this can’t be the end of the story, because sitting and standing are properties that things have absolutely, not just relative to moments of time. Put it like this: suppose I am sitting. Then even if there were no instants of time, I would still be sitting; there do not need to be moments of time in order for me to be sitting. Lewis’ argument has inspired a number of different responses from philosophers. Presentists have some sympathy with Lewis’ idea that qualities like sitting and standing (or being green or brown) are possessed absolutely rather than relative to moments of time. In contrast, some Eternalists reject this idea, and are content to describe change with reference to moments of time. Other Eternalists follow Lewis in radically reconceiving what it is for an object to change over time: they argue that ordinary objects like you and I are ‘stretched out in time’, as well as filling up a portion of space. Over two and half millennia since Parmenides argued against the very possibility of change, the philosophical debate concerning change continues.